I was looking forward to playing this game a little. 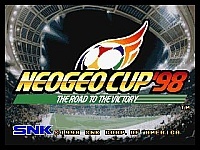 I don't mind arcade style football games like the ones on the Neo Geo (but prefer more realistic simulation games), so I was hoping that this game would be good. As it turns out though, this is not really all that much different to the last Super Sidekicks game. In fact, it is perhaps not as good. I know that most football games are usually the same as each other, especially if they are sequels (FIFA anyone? 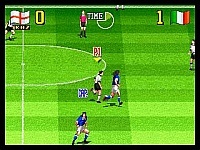 ), but I can't see much difference between this and Super Sidekicks 4. Maybe I am missing something, but it seems to be almost exactly the same game, albeit with different presentation screens. If somebody could let me know the difference then I would be grateful, because I can't see much! One thing that I can point out is that the game seems a tiny bit slower. Oh and you now get to choose a particular area of your team to have powered up before a match. 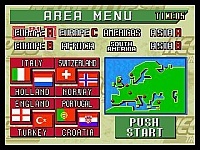 You can also choose from a number of different tournaments to play in, including the World Tournament, America Tournament and the Asia Tournament among others. Now don't misunderstand me. It's not entirely a bad thing that it is almost the same as Super Sidekicks 4, because that was a very good game already. It does show that this was only a cheap release to cash in on the World Cup of '1998 though. If you want a little bit more info on these games, then you could check out my reviews of the other Super Sidekicks games (see the links below). The same thing applies to the graphics as well. Little or no effort has been put into making them any different than the previous versions, apart from the changed presentation and intro screens. I suppose that it is hard to do much with the graphics on a football game and this is probably the pinnacle of sporting games on the Neo Geo. They look good, just don't expect anything particularly great. Likewise, the sound is just the sort of thing that you would expect from a football game (I must stop saying this in all my sports game reviews :) . It is nothing to write home about. Overall, this game is still fun and if you like Super Sidekicks then you will enjoy playing it. It just isn't anything too special. 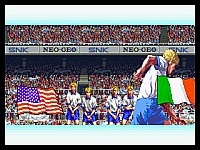 If you own a Neo Geo and also have Super Sidekicks 4 then don't even consider buying it, it simply isn't worth it. In fact, if you don't have Super Sidekicks 4, get that instead because it is a marginally better game in my opinion... provided you can afford the home cart or can play MVS carts that is!